If you love a good eggplant dish, this baked eggplant parmesan recipe is the perfect choice for dinner tonight. It's a bit like eggplant lasagna without the ricotta cheese, but, as you can see, it bakes up beautifully and it holds together very well. If you can't pass up a simple recipe that takes little to no prep work, then you have to try this eggplant parmesan. It'll be a huge hit every time you make it (without slaving over a hot oven to get it ready)! It wasn't as creamy as the eggplant lasagna, which is still our favorite eggplant recipe, but this one is almost too close to call. If you're cooking for a crowd, this is a great substitute for chicken parmesan that will go over very well with your non-vegetarian friends and family. And it takes less than an hour to make if you prep smart! The worst part is dipping and coating your eggplant slices, which doesn't take too awfully long if you use one of these simple little tricks to get them ready for baking. Pour your breadcrumbs into a bowl big enough for dipping your eggplant slices and mix in the garlic salt and dried basil. 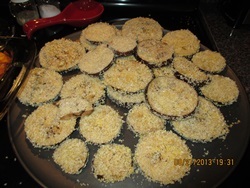 Dip the eggplant slices the beaten egg and coat with an even layer of seasoned panko breadcrumbs. Place in a single layer on a large baking pan and bake for 10 minutes. If you have to do more than one batch, that's ok, just use another pan or go ahead and do the next couple steps below to free up the one you're already using. Spread half the spaghetti sauce over the bottom of a prepared 9x11 baking dish. Place a single layer of eggplant slices on top of the sauce to thoroughly cover the bottom of the dish. Sprinkle half the mozzarella and half the parmesan over the eggplant layer. 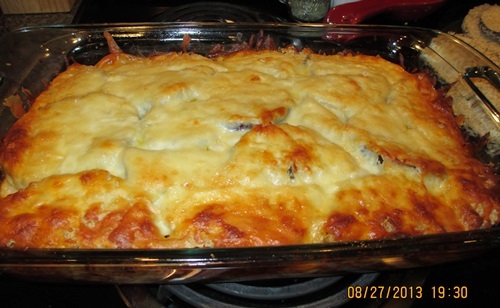 Spread the last of the spaghetti sauce over the cheese and layer on the last of your eggplant slices and cheese. 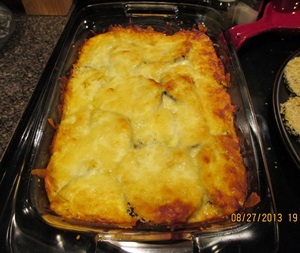 Bake your eggplant parmesan for about 35 minutes, uncovered until the cheese is a nice, golden brown color. Enjoy! Want a super quick way to coat your eggplant? Dip them in egg and lay them out on a plate or flat pan and sprinkle the breadcrumbs evenly over the top. Turn them over and sprinkle the other side before putting them on your pan for baking. Alternatively, you can coat them in egg and then toss the slices, a few at a time, into a big ziplock baggie full of breadcrumbs. Shake gently to coat and then carefully remove them from the bag and lay them in a single layer on your pan to bake.